The meagre land, short harvest times and long winters made the farmers’ work very demanding. The climatic as well as the topographic conditions required a high degree of know-how and experience. In order to create an economic coverage, sophisticated ways of working were necessary on the individually and jointly used land. Thanks to the larger families it was possible to farm the land, alps and woods profitably. They succeeded in using the sun’s warmth thanks to their construction techniques. 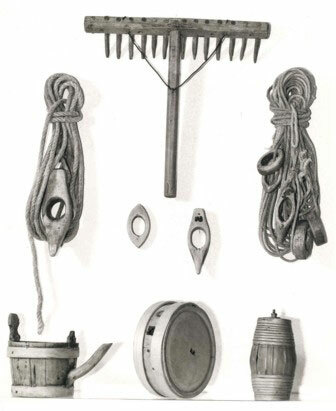 Further, they developed special ways of storage to preserve their agricultural products. Surpluses from the agricultural products were sold whereas many goods for daily usage had to be bought. While slaughter cattle was used for their own consumption, they could offer breeding cattle- mostly young calves- on the markets. The takings from this sale represented an important income. If a cow meant to be sold got sick or died this could mean a whole year of poverty for a small farmer. The Walser offered high-quality cattle and were seen as competent breeders. A lively trade emerged between the Walser villages and neighbouring regions; often even in more distant places. 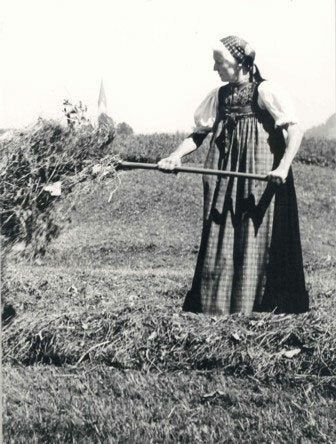 The Walser farmers had a strong craftsmanship and generated enormous performances in order to independently carry out the necessary tasks in their villages themselves. They worked as bricklayers, carpenters, shoemaker, dressmakers, blacksmiths, weaver, butcher and saddler to name a few. The goods were mostly fabricated during the quiet winter months and could be offered for sale in other regions, too. This stimulated trade and caused that many craftsmen worked far away for months to secure their families and small homes. Corresponding to the development in the valleys certain secondary industries emerged and often became considerable companies over the years. Because of that new sources of earning were created and the communal structures changed. The industrialisation in Europe replaced the slow development that had lasted for over 500 years. Due to the increased accessibility in transportation, the motorisation as well as the electrification changes took place in the Walser villages, too. The same thing could increase profitability in one place and take away the chance to earn money. Migration was the result and many villages lost their younger inhabitants. Tourism started as early as the 19th century in the alps representing one of the most grave changes in the Walser regions. Many of the former peasants became hosts. Taverns, hotels and guesthouses changed the view of many places. New professions were learnt creating new chances to earn money.